You need to format the disk in drive J before you can use it. Do you want to format it? Can you run TestDisk on your disk instead of a drive? Drive is like a partition. Only a disk has a partition table and delivers correct results. Please use the latest version of TestDisk 7.1WIP and 32bit. Disk / dev / sd* (*=a,b,c). 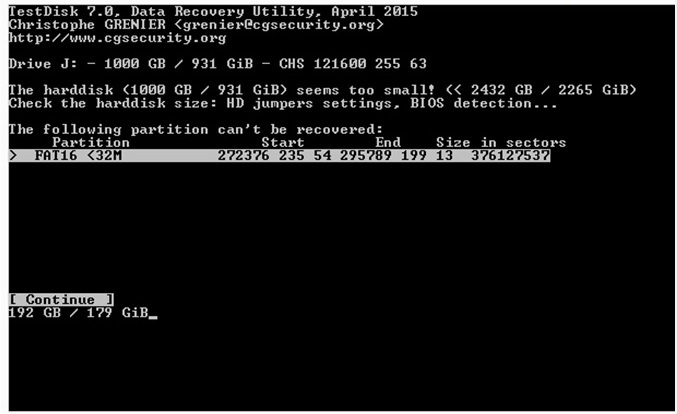 Select found partitions by TestDisk and press p on your keyboard to have a try to lisdt your files. Hello Fiona, thanks for yours words of support. I'm not english, so, when you say: "run TestDisk on your disk instead of a drive" do you mean that I have to run testdisk on my external hard disk the one that I want to recover? The, where I have to run the Testdik: in Windows (C:) or in "Disco local (B:)? Last edited by Bety on 21 Nov 2015, 16:19, edited 1 time in total. No, there is no necessity to run your windows explorer. After starting TestDisk, the first display is log file creation. Pressing enter takes you to your disk selection. At this display you should select your affected Disk instead of your drive. My selected Disk is "Disk /dev/sdb". It's my Intenso USB 3.0 Device. The last Device is Drive G: and also my Intenso USB 3.0 Device. At this display you should select your Disk and not your Drive. I downloaded the "Windows 64-bits" althougth i don't understand what means "Use only on systems lacking WoW64 as some features are missing" It's correct that i downloaded the testdisk for 64 bit? Then, I open it in my Computer downloads folder (it's correct then to run test disk in my computer "C:" disk? 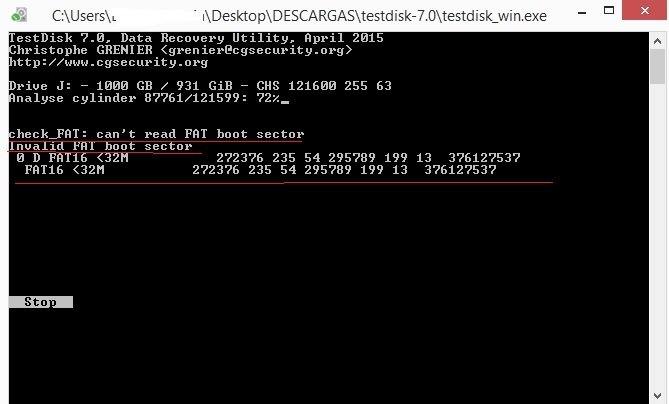 and I have to open the file called: "testdisk_win"
Can you help me please Fiona? perhaps it'sd better that i run testdisk version windows 32bits in another compyter that has Windows XP? Last edited by Bety on 21 Nov 2015, 17:45, edited 1 time in total. There is a description that some features are missing. It's only intended for genuine 64bit computer like Itanium etc.. Yes you can run it within your download folder. It doesn't matter, because I run testdisk within my download folder too! But you should unzip it. Ok, then I download your file called: "testdisk-7.1-WIP.win" for my windows 8 computer which has 64 bits. ¿Correct? 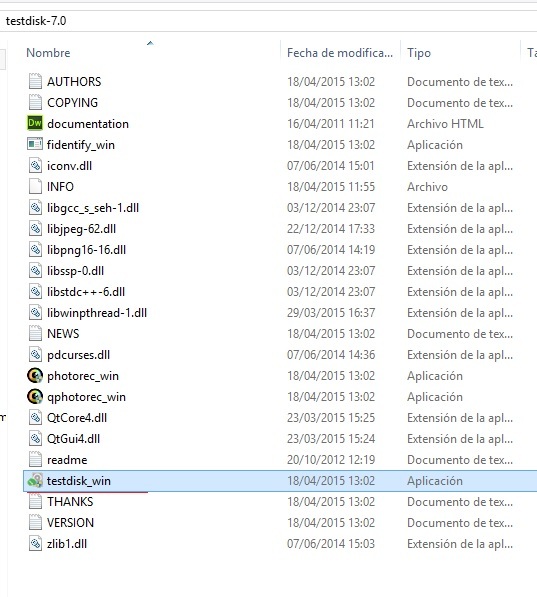 althoug the "readme file" inside, does not says nothing about windows 8, ¿I go ahead ? the disk called "Disco local (B:) is the one I need to recover with all the files, because are the files of my work that sustain myself, is the second one in the options of testdisk perhaps? I must to press to "quick search"?